This recipe, which is slightly adapted from the Food Network, is beyond easy. Seriously, only FOUR ingredients! I made several loaves of this bread as gifts for our neighbors at Christmas. I had one neighbor tell me that she inhaled the entire loaf in one day! The flavor of the bread is greatly influenced by the beer you use. I like to use lighter, sweeter tasting beers, such as Leinenkugel's Honey Weiss. Preheat the oven to 375 degrees. Grease a loaf pan and set aside. In a large bowl, combine the flour, sugar and beer and mix well. The mixture should be sticky. Pour into the loaf pan and bake for 55 minutes. At the last 3 minutes of baking, remove from oven, brush the top of the loaf with margarine and return to oven. Tip: Don't have self-rising flour on hand? Then substitute 3 cups all-purpose flour, 1-1/2 teaspoons baking powder and 1-1/2 teaspoons salt. Quick Start with MSPI Mama: This is one of my Quick Start recipes, but make sure you leave off the margarine. I made this last night and it was soooo good. I love bread and it's hard to find any fresh bakery bread that is MSPI friendly. Also just wanted to say that I just happen to come across your blog and THANK YOU so much for posting recipes. I have been dying for some chocolate cake. I am going to make it tonight. 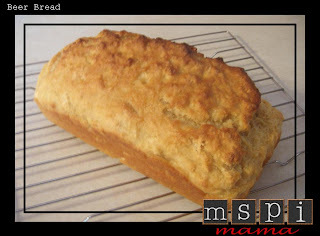 I've been avoiding bread (other than brown rice bread.. blech) for about 6 months since we found out my 2nd babe has MSPI.. when I found this I made it immediately!!! It's still in the oven but I'm soooo excited to eat it and just wanted to say thank you for such an easy bread recipe! I've been meaning to make my own bread for a while now but haven't had time.. this one is sooo easy! thank you for your website, I'm so glad I found it! !